Manchester United continued their resurgence by recording a fourth straight win which proved enough to see off a disappointing West Ham outfit 3-1 at Old Trafford. Danny Welbeck's first goal on home soil since October 2012 was followed by a superb effort from Adnan Januzaj as United took command before the break. Substitute Ashley Young then produced the perfect first-time finish to Wayne Rooney's lay-off to ensure Carlton Cole's late strike was nothing more than a consolation. It was not all good news for United manager David Moyes. Welbeck departed with an injury early in the second half and Januzaj blotted his copybook when he was booked for diving. However, their present winning streak equals the best United have managed since Moyes replaced Sir Alex Ferguson in the summer and represents an encouraging entrance to the festive campaign, when United really need to hit the accelerator if they are to mount any challenge towards the top end of the table. A brilliant reaction save from Adrian to deny Tom Cleverley inside the first minute, followed by an extended period of possession without creating too much hinted at another difficult afternoon for the Red Devils. Staring at the potential of losing three successive home games in the league for the first time since 1979, any anxiety at Old Trafford that had previously been suggested, might just have been starting to show itself. Yet, with the home supporters remaining resolutely behind their team, United retained the confidence to attack. And when Welbeck found the returning Rooney and was on hand to collect the return, he had sufficient self-belief to drive an effort goalwards. 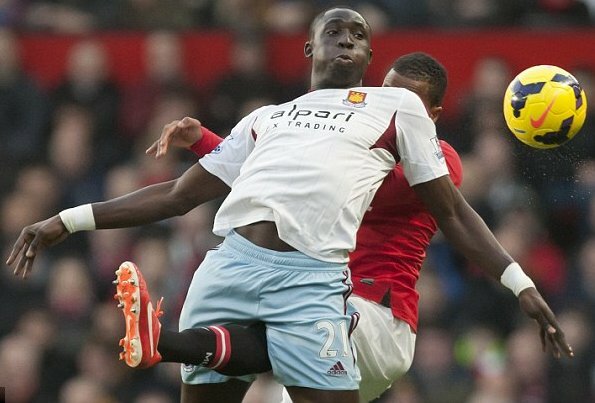 Making his Premier League debut, Adrian did not really cover himself in glory as the ball flew under him. Not that Welbeck was complaining. His first goal in this stadium for an incredible 427 days took him to six for the campaign, three times as many as he managed in the whole of last season. After that, Januzaj took centre stage. The 18-year-old received a rebuke from Mark Noble when he went down in the box, yet the West Ham man had levered him out of the way and was fortunate not to concede a penalty. Within a minute, Januzaj was exchanging passes with Welbeck and powering home his first goal on home soil. It was not a moment James Collins will remember with any affection. As experienced as he is, Collins was made to look foolish by the ease with which Januzaj stepped aside him. Clearly a player with huge promise, whom Moyes confirmed on Friday had far exceeded expectations, the wide-man evidently has some learning to do. A blatant dive by the touchline drew a deserved booking from Michael Jones. Moyes has already spoken to Young about this unsavoury tactic, with some success, and doubtless will do the same to Januzaj. For Ravel Morrison, dumped by Ferguson after three substitute appearances after the Scot grew weary of trying to get him to concentrate on fulfilling his immense talent, it was a rather inauspicious return. The contest itself rather passed him by and whilst Morrison was not the only West Ham player to suffer that fate, he was also booked for a crude swipe at Cleverley. Welbeck's departure 10 minutes after the re-start with what appeared to be an ankle injury was not the greatest development for Moyes given his already lengthy list of absentees. United do have options though, as substitute Javier Hernandez proved when he fired home from 12 yards, only for the effort to be incorrectly ruled out for offside. The hosts did not need to wait long for their third though, with Young continuing his superb week by applying the finish to Rooney's lay-off. Moyes took the opportunity to give hard-working full-back Patrice Evra a break. However, it was the Frenchman's replacement, Alexander Buttner, who lost his concentration to allow Cole to break the offside trap for the Hammers' late strike, which denied United their biggest home win of the campaign.